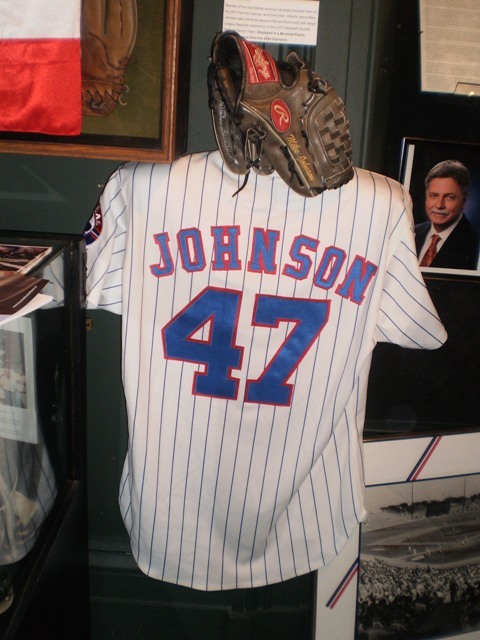 Mike Johnson’s game-worn Montreal Expos jersey and glove were just two of the amazing artifacts on display at the Canadian Baseball Hall of Fame on induction day.  Around 1,500 people were on the Hall of Fame grounds on Saturday for the events surrounding the induction of Expos legend Rusty Staub, New Brunswick-born big leaguer Rheal Cormier, current Milwaukee Brewers GM Doug Melvin (Chatham, Ont.) and the Pan Am Games gold medal-winning Canadian Senior National Team. I’ve been to over a dozen of these ceremonies in St. Marys and this was perhaps the largest crowd ever.  On top of Rusty Staub and Rheal Cormier being inducted, several other former Expos were in St. Marys over the weekend, including Jim Fanning, Bill Atkinson, Steve Rogers, Larry Landreth, Mike Johnson and Derek Aucoin.  Speaking of Derek Aucoin, I had the opportunity to meet him and his lovely wife Isabelle and beautiful baby boy Dawson. And yes, Dawson is named after former Expos great Andre Dawson.  One of the most touching moments of Saturday’s ceremony occurred when Hall director of operations Scott Crawford announced that the museum would be renaming their volunteer award in the honour of Randy Echlin. Echlin, a former Ontario Superior Court judge, was a lifelong volunteer with the Hall before he died of cancer last August. Randy’s wife Ann and his children, Rob and Libby, were on hand for the ceremony. Libby was being married in the induction tent that night to honour her father.  National Baseball of Hall of Famers in attendance were Cubs legend Fergie Jenkins and longtime Blue Jays GM Pat Gillick. Toronto Sun columnist Bob Elliott, who will become the first Canadian to receive the National Baseball Hall of Fame’s J.G. Taylor Spink Award for meritorious contributions to baseball writing, introduced the Baseball Canada Senior National Team that won gold at the Pan Am Games.  Congratulations to Baseball Canada Senior National Team executives Ernie Whitt (manager), Bernie Soulliere (business manager) and Stubby Clapp (hitting coach) who became the second, third and fourth double inductees of the Canadian ball hall. Whitt and Soulliere were inducted as individuals in 2009, while Clapp was a member of the 1991 Canadian National Youth Team that was enshrined after they won gold at the World Youth National Baseball Championship in 1991. The only other double inductee is John Haar, a Vancouver native who managed the 1991 National Youth Team and was inducted as an individual in 2007.  It’s always great to hear former Expos manager Jim Fanning speak. The now 84-year-old Fanning, who was inducted in the Canadian Baseball Hall of Fame in 2000, introduced Rusty Staub at the ceremony. In his speech, Fanning spoke of the trade that brought Staub to Montreal in 1969. Fanning also believes that the National Baseball Hall of Fame Veterans Committee will induct Staub. With 2,716 career hits over 23 seasons, Staub has a shot at Cooperstown, but it’s a long shot at best. Nice overview of the event. Thanks. Hope you enjoyed the festivities. Thanks for all your efforts in making it a great weekend, Scott. Talk about a awesome baseball day. Thanks for the great recap Kevin. Thanks Devon. It was a great day no doubt.